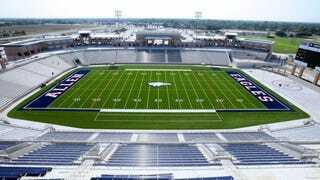 Two years ago, the football-mad suburb of Allen, Texas, sank $60 million into a state-of-the-art, 18,000-seat high school football stadium. Now, according to the Dallas Morning News, the stadium will be closed for the upcoming season because it has been deemed structurally unsafe. But an analysis commissioned by the district shows engineers have found design deficiencies at the concourse level, according to documents released toThe Dallas Morning News. Partial findings by Nelson Forensics indicate that some support structures were not designed in a way that would hold the weight anticipated on that level of the stadium. "The stadium is not safe for public assembly," Superintendent Lance Hindt said. $60 million can buy a stadium with a jumbotron, but it can't guarantee a solid support structure. Hopefully the stadium can be repaired in a reasonable amount of time, otherwise the wolves will move in.